The elders of our community are a treasure, and each one of them has a wealth of lifetime experience that we are passionate to listen to as we care for them. Each of our senior home care patients is an individual, and we treat them that way. We carefully develop home nursing care plans with your loved one’s doctor and with your family so that he or she receives the exact skilled nursing care, companionship and understanding needed. Just as every senior’s personality is different, there are no two seniors who age just the same. Some seniors struggle through the various levels of Alzheimer’s. Others suffer no signs of dementia, but struggle with other chronic health problems like diabetes, Parkinson’s or severe arthritis or other physical degenerative diseases and conditions that require daily in-home care. Some seniors are struggling with terminal illnesses and need even more support and understanding as they and their families face difficult emotions. Some seniors have a combination of these problems and require even more intensive medical care and therapy to keep their quality of life enjoyable as long as possible. 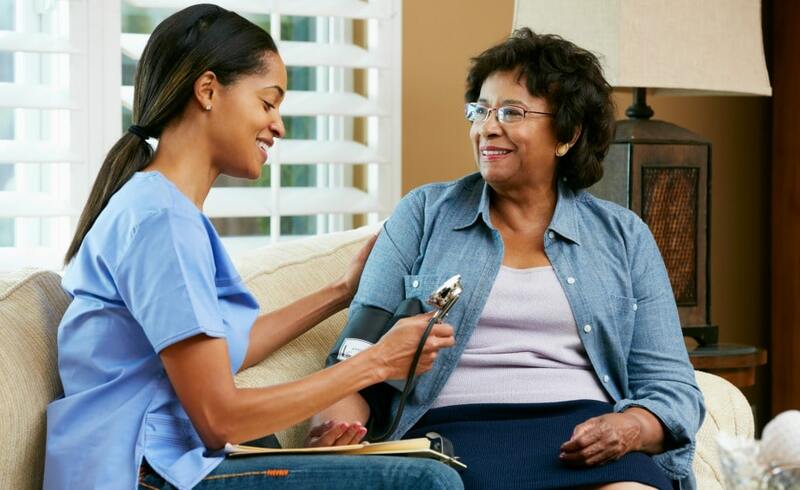 To be the best senior care company in Manassas, we have developed specialized care teams consisting of the exact professionals who can skillfully and compassionately provide the home care your loved one needs in a very individual, satisfying way. One of the hardest things for many families with an aging loved one is that they can’t always be there to help when they want to be—when they feel they need to be there. We understand how hard this is, and work hard to help alleviate this emotional strain. Our skilled nursing care team and therapists can provide that 24/7 in home senior care so that you know your loved one is safe and receiving the best care and companionship possible when you can’t be there. We will work with you to create the care schedule that best fits your family’s needs so that your loved one never has to feel alone, you can still play an active role in their care, but not worry when you have to work or take care of other responsibilities. The At Home Personal Care team consists of skilled nurses, physical and occupational therapists and a host of other professionals and companions whose references, credentials, backgrounds and experience we investigate exhaustively. To be known as the best senior care company in Manassas, our team members must also be the best in their fields! We require that they not only be up to par in their professional knowledge, but through hands-on skill assessments we can also determine if they have the levels of reliability, compassion and excellence we expect of our team members. We also understand that you will want to choose the professionals working with your senior loved one—we work tirelessly to help you interview and get to know our professionals to create the right team who will be able to provide the best home care for your loved one. Mental and emotional health are inextricably tied to physical health. The stress of being ill and in pain, or the emotional roller coasters encountered during chronic or terminal disease can negatively impact the length and quality of life. This is why we work so hard to provide the compassionate companionship and listening ear that you and your loved ones need through these mental and emotional difficulties. In addition to the skilled nursing care and therapy we are able to provide, we have companions who can simply listen and provide emotional support. We can read books, play board games or cards, watch movies together, do crafts—things that bring light, emotional relief and positivity into your senior loved one’s life. Positive, social companionship has a definite positive impact on your loved one’s medical outcome, life span and quality of life. At Home Personal Care will always strive to be the best senior care company in Manassas because our passion is making lives better. We will work with you to develop a care plan for your loved one that helps them stay as well, happy and independent as they possibly can. Call and talk with us today at (703) 330-2323 and let us know how we can help.